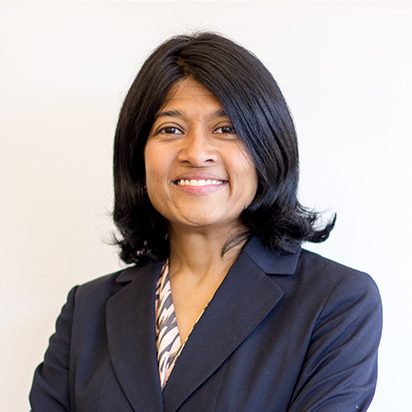 Sampriti Ganguli is Arabella Advisors’ chief executive officer. She oversees all aspects of the firm’s performance, including revenue, operations, strategic growth, marketing, and client services. Sampriti drives and executes Arabella’s business strategy, sets operational priorities, and manages senior staff. She is also responsible for enhancing systems and policies that enable Arabella to deliver on its mission—to help foundations, philanthropists, and investors who are serious about impact achieve the greatest good with their resources. Sampriti joined Arabella after 14 years at Corporate Executive Board (CEB). As executive director of CEB’s legal, risk, and compliance practice, she focused on operations, strategy, marketing, and new business development, and managed the firm’s subscription-based research programs for internal auditors, general counsel, chief risk officers, and chief compliance officers. She also spent three years as managing director of CEB’s government practice and, before that, eight years as managing director of the company’s finance practice. She has authored more than 25 major papers on topics ranging from risk and talent management to collaboration, benchmarking, and technology adoption. Earlier in her career, Sampriti worked at JPMorgan Chase’s Emerging Markets Research division in Singapore and as a consultant for the World Bank’s East Asia Environment and Social Development Unit. She also sits on the board of InsideNGO, an association dedicated to strengthening operations and leadership capabilities of international non-governmental organizations. Sampriti is the recipient of the Corporate Trailblazer Award from the National Black MBA Association in recognition of her focus on increasing diversity in the workplace, and she received a 2016 Brava Award from SmartCEO magazine for her focus on women and leadership in the charitable sector. Sampriti received a BA with distinction in economics and political science from Swarthmore College. She was awarded a full-tuition Freeman Fellowship to the Johns Hopkins School of Advanced International Studies (SAIS), where she earned an MA with distinction in international affairs. She then received her MBA from the University of Pennsylvania’s Wharton School. A mother of two, Sampriti speaks five languages and enjoys Latin dancing, Zumba, historical fiction, and Asian cooking.